It's the arduSTAMP! eletroFUN's minimal design approach to Arduino. 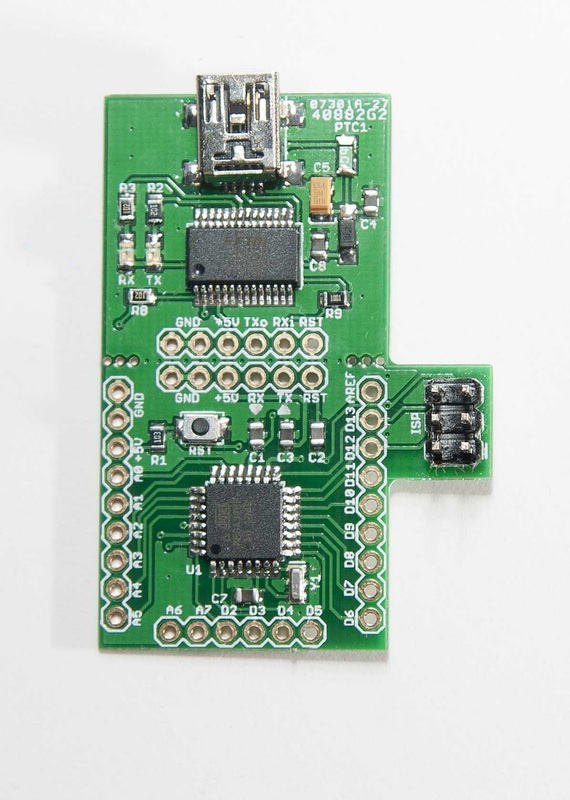 It requires a 4.5-5.5V regulated power source or it can be powered off the USB when running at 16MHz or between 1.8V to 4.5V when running at 8MHz. I comes with adaboot bootloader already programmed (select 'Arduino Duemilanove w/ 328' within the Arduino software). It's a great board that will get you up and running quickly. The arduStamp series is meant for users that wish to prototype something fast and then make it part of their project. 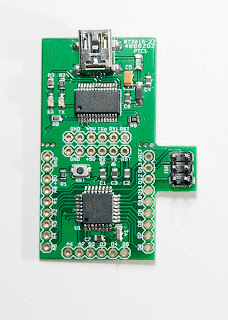 If your final product doesn't need the USB to serial interface the Main Board can be separated from the USB interface, so you get two products in one. fully assembled arduSTAMP - a fully assembled arduStamp with no header pin connectors apart from the ISP.